Large-cap stocks simply don't increase 280% in a single year without a clear and meaningful catalyst. 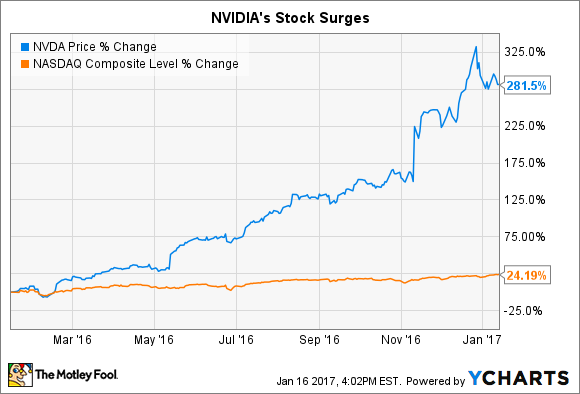 That's exactly the case with graphics semiconductor giant NVIDIA (NASDAQ:NVDA), whose shares were one of the best performers on the market in 2016. As you'll see, NVIDIA's central role in several of the fastest-growing markets in technology should fuel its continued revenue and profit growth for years to come. However, NVIDIA's red-hot shares also create their own unique risks that could make the company's stock fall in 2017. To be clear, NVIDIA's business momentum looks likely to continue in the year ahead, barring some unexpected catastrophe. For example, its sales are expected to increase 50% in its current quarter and 43% next quarter. As a general proposition, business is good at NVIDIA. So what could cause NVIDIA's stock to fall? Unfortunately, NVIDIA's valuation also reflects the ample growth the company is likely to experience. Here's a quick snapshot into the GPU specialist's current and forward valuations break down. Data sources: Yahoo! Finance, multpl.com. There's a lot of optimism already currently baked into NVIDIA stock at a valuation nearly 3 times that of the S&P 500, which, it should be noted, also trades at its own elevated valuation. This matters because any near-term hiccup in NVIDIA's performance could trigger a meaningful pullback in its shares. NVIDIA's beta is 1.76, meaning its shares are nearly twice as volatile as the market index. In times of a rising market, this can lead to meaningful outperformance; it bears noting that a meaningful portion of NVIDIA's rally has also been fueled by its individual growth story. The downside of having a beta greater than 1 is that NVIDIA shares could fall far faster than the average stock should something go awry. This "live by the sword, die by the sword" dynamic is a frustration that unfortunately comes with the turf when investing in growth stocks. Professional short sellers are already targeting NVIDIA's aggressive valuation as one reason its stock price should pull back to a more justifiable level. Late last December, boutique research firm Citron Research tweeted its argument against NVIDIA's valuation, citing a number of reasons the stock had become overvalued. I think several of these are simply overstated, particularly the patent licensing narrative with Intel (NASDAQ: INTC). If launching a competitive GPU business were merely a function of accessing NVIDIA's IP business, you can rest assured Intel would have already done so by now. Similarly, the Intel licensing revenue deal only contributes $66 million to NVIDIA. For a company that earns around $2 billion each quarter (and growing! ), this seems like a fairly negligible risk factor in my view. If I had to select a risk factor from Citron's list that could hamper NVIDIA, it would be the mounting competition for data center graphics chips. Intel and AMD both see the growing demand for graphics processing capabilities in the data center as a potential gold mine. In fact, both Intel and AMD each have developed pipelines to challenge NVIDIA's dominance of this space. However, NVIDIA's chips remain the de facto standard in the industry across all aspects of AI and deep learning applications and the company's own development timeline should allow it to maintain its edge, even as additional entrants enter the space. Investors want to avoid overpaying for stocks, so the current discussion over NVIDIA's trading multiples is understandable. At the same time, quibbling over whether a growth stock like NVIDIA should trade at a 70 or a 65 multiple also risks missing the forest for the trees. The important distinction here involves understanding the scope of a growth company's opportunity. Companies that merely have above-average potential should be valued with a greater level of precision. However, companies whose growth opportunity involves powering several industrywide shifts can be valued with a little less precision, and I think NVIDIA falls in this latter camp. Recall that NVIDIA's GPU chips are currently the graphics processor of choice for software in self-driving cars, artificial intelligence software, and more. Depending on your preferred estimate, tens of millions of self-driving cars will be active around the world in about a decade. Similarly, AI and cognitive systems software is expect to become a foundational business tool in most industries in the decades to come. Given its current technological leadership among GPU producers, it seems plausible to expect NVIDIA chips to play a prominent role in helping power each of these tech trends. With much of this growth so far in the future, coming up with a reliable earnings estimate is probably an exercise in hubris. However, if you believe that these trends will indeed come to pass and that NVIDIA will remain a leading supplier to these big ticket growth trends, its P/E ratio today become less and less relevant to the overall investment thesis. Rare is it to find stocks with NVIDIA's type of growth potential trading at or below fair value. However, it's understandable that members of the investing community worry about NVIDIA's valuation. We've seen this refrain populated time and again with world-changing companies such as Amazon.com, Netflix, Alphabet, Tesla Motors, and many more. So while its lofty valuation indeed could be a near-term liability for NVIDIA, focusing too much on its current valuation risks missing the bigger picture.